Photo courtesy of Savion Glover Productions. 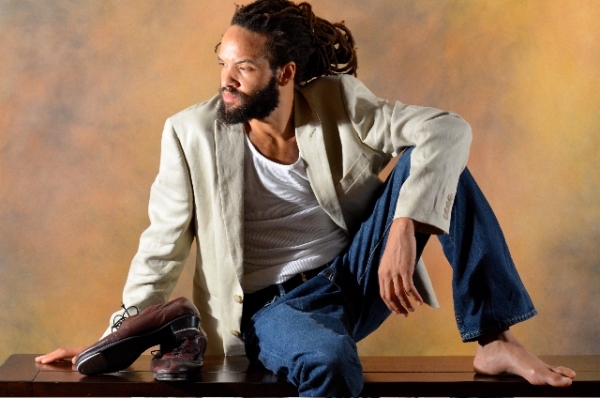 Savion Glover is synonymous with tap dancing; known for his Broadway performances in The Tap Dance Kid and his Tony Award-winning choreography for Bring in 'da Noise/Bring in 'da Funk, Glover, who, in many circles is single-handedly credited with keeping the art of tap an integral part of dance culture, remains one of the world's most renowned performance artists today. Here, he talks about the Windy City debut of his tap dance concert, STePz, what inspires his choreography, and what Chicago can expect from the "STePz experience." You've worked with tap legends like Honi Coles; however, you honed your chops with the late Gregory Hines. Prior to meeting him, how did you get your start -- when did you know you loved the art of tap dancing and that you had "it?" I started dancing when I was 7 years old. I took basic tap classes and I took those classes up until I met some of the greatest tap dancers of our time like Jimmy Slyde and Lon Chaney. It was not then that I realized that I had it, but it was then that I realized that I wanted it. I wanted to be a part of what they were doing. And as I continued my "learning" under their tutelage, I realized what I had gotten myself into as far as being in part of a tradition and a family that would be recognized as a great group of tap dancers. Speaking of Gregory Hines, Jimmy Slyde, Lon Chaney, et al, early on, what advice or lessons did they have for you? I've gotten so much advice. I got advice and I learned from them every day -- it wasn't like "do this on your left" or "do this on your right" -- I learned life tools. As you know, historically, tap dancing has always been stigmatized; even with your tenure and accolades, are there still instances where you are confronted by this? As long as we, as black people, have an image of "Sambo" or somebody eating some crazy watermelon with seeds popping out the ears -- as long as we have that image still around, everything we do as a people is going to have a negative thought or stigma associated with it. To this day, in my opinion, it's still not taken as a serious art form. Some have acknowledged the dance form as serious but others have yet to reach that level of intelligence as it pertains to the dance. This month, you're bringing your show STePz to Chicago. Give us an overall concept of the show. Basically, I consider STePz to be a very high energy tap dancing concert. The "steps" represent the steps in my journey as a tap dancer, and the songs and musicians that I chose for this production are entertainers that I've been influenced by. We also re-introduce this idea of tap dancing on staircases -- this is our tribute to some of the great dancers like the Nicholas Brothers, Bojangles and the Berry Brothers, who lent their energy to tap dancing on stairs. Overall, I think it's gonna be an enjoyable evening of tap dance and theater. In your choreography, you are well known for keeping the old school tradition of tap intact while also incorporating a modern edge. For your current themes, where do you typically draw from? We implement these modern energies but I'm always influenced by and I always draw from those from past because I feel that anything we do now is just a reinterpretation of what was done before. For choreography, I look at people like Alvin Ailey and Martha Graham; strangely enough, I reach for and look to non-tap dancers for inspiration. And because of the pace that we have to maintain and the presentation of the whole thing, I find myself looking at other types of dance to allow me to help paint the picture. You have special guests who will take part in STePZ -- 3CW (3 Controversial Women) & Marshall Davis. Tell us about them. Marshall Davis is my good friend and one of the great tap dancers of our time. Sarah Savelli, Robyn Watson and Ayodele Casel will also be a part of the show. I'm happy that we're all able to come together for this particular production because we've danced together before but this is the first time we're dancing together as a group. I've danced with all of them individually in the past. In the dance world, you're looked at as the official "torch carrier" -- what are your thoughts on that? I don't speak about it like that. This is my life. I will honor it with responsibility as long as I am able to do so. In addition to your HooFeRzCLuB School for Tap, you do lots of work with kids. As far as tap and the interest in it, what are you seeing out there? Are there any more "Tap Dance Kids" in the making? Tap dancing is gonna be around forever. It was here way before you and I -- it's been here ever since air. But at this point, I know that I can only speak for my experience. Everyone has their particular approach and reason why they tap dance. I guess there are gonna be many more tap dance kids, but there'll never be another me, just like there will never be another you. We're all individual. I'm looking forward to whatever may come out of the next generation of kids who tap dance but there will never be another Jimmy Slyde, Gregory Hines, Sammy Davis, Jr., Frank Sinatra, Michael Jackson, or whoever. We know your work as a dancer, but you're also no stranger to the big screen, having been in Spike Lee's Bamboozled. Are there any plans for more film projects? Hopefully. I see a lot of things and offers that come, but I guess I'm meticulous about what I do or how I am seen or what I choose to represent. It has to be something worth doing both on an educational front and be representative of what I am as a man in this world. I've seen many roles that I've been offered and then I go to the movies and I say, "Oh okay, that's what they wanted me to do -- glad I didn't accept that role." What will the audience get from the STePz experience? I think if they will allow themselves to, they will enjoy an evening of high energy tap dance in the theater. STePz is the opportunity for people to reflect or possibly deal with some emotions and then celebrate, all done through tap dance. I anticipate a wonderful experience in Chicago and I encourage all lovers of dance and lovers of theater to come out and enjoy the evening. See STePz, Friday, Jan. 24, at the Harris Theater for Music and Dance, 205 E. Randolph St. Show time is at 7:30pm; tickets are $30-$55. For more information, call 312-334-7777. NOTE: A special performance will be held Saturday, Jan. 25 at 2pm; tickets are $10-$15. Part of the Harris Theater's "Family Series," this hour-long, family-friendly performance is for families and children from ages 4-10.